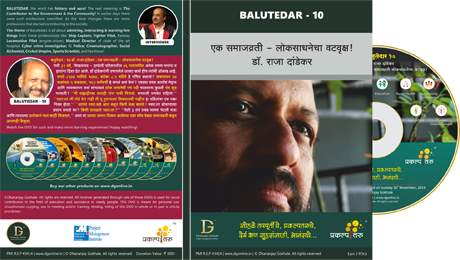 Balutedar, the word has history and aura! The real meaning is The Contributor to the Government & the Community! In earlier days there were such professions identified. 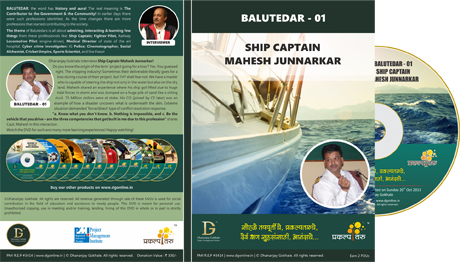 The theme of Balutedars is all about admiring, interacting & learning few things from these professionals like: Ship Captain; Flight Captain, Railway Locomotive Pilot, Administrative in-charge of state of the art hospitals; Cyber crime investigators; CID Incharge; Cinematographer, and like these! Reason : Why are we interacting with these BALUTEDARs? A very first reason is that all these professions have always been a point of attraction for a common man right since childhood. Most of us must have had dreams of becoming such and similar professionals. There is always an interest to know more about them! So the first reason is to quench the thirst to know about them. There is lot to learn from these professions like communication, creativity, discipline, passion, ability to think and work on all possibilities, extreme alertness, lots of data crunching with calm mindset, decision making in all time hard-pressed scenarios, emotion management, ..so on and so many. Therefore, the second reason is that one can admire many of these competencies and start working on it. This interviews shall be a great learning through admiration! Past Instances : What Happened? Do you know the origin of the term 'project going for a toss'? Yes. You guessed right. The shipping industry! Sometimes their deliverable literally goes for a toss during course of their project. But THY shall fear not. We have a master who is capable of steering the ship not only in the water but also on the dry land. Mahesh shared an experience where his ship got lifted due to huge tidal forces in storm and was dumped on a huge pile of sand like a sitting duck. 75 Million dollars were at stake. His CO (joined by CE later) was an example of how a disaster uncovers what is underneath the skin. Extreme situation demanded 'force/direct' type of conflict resolution response. "a. Know what you don't know, b. Nothing is impossible, and c. Be the vehicle that you drive – are the three competencies that got built in me due to this profession" shares Capt. Mahesh in this interaction. Watch the DVD for such and many more learning experiences! Handling camera is no joke. Some people have made a living out of cameraman's mistakes in Hollywood films. Yes, AXN TV runs a serial on this. It's incredibly funny to see an aeroplane flying in an ancient movie. Cameramen are so hysterical about this; they suffer from what they call as Cashier's decease! Always worried about would it tally or not?. May be that's why a camera is fitted with a view-finder. "I started understanding emotions of people. This industry requires you to be a nice human being. There is a lot of respect to creativity & a great PR helps. You have to be a good human being. There are lot of stakeholders. Spot boys are the ones who serve food on the sets. Their way of going about their jobs sometimes creates funny incidents" – expresses Sanjay in this interaction. Watch the DVD for such and many more learning experiences! There is lot to learn from these professionals! Railway Loco Pilot, fondly known as Engine Driver is a profession that attracts most of us. Maneuvering the engine that pulls a train weighing 3500 tons, maintaining minute-to-minute punctuality sheet, being utmost aware about caution roster, having extremely strong eyesight to catch the signal movements couple of miles away while continuous alertness and awareness about the functioning of engine. Isn't it a great deal? 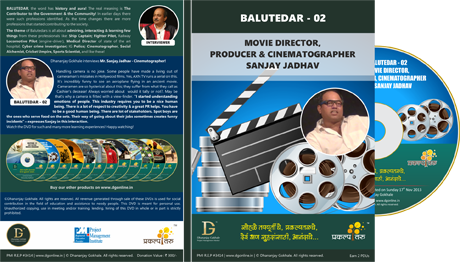 This DVD contains the video of interview & brings out an intriguing interaction done in a very fun filled open atmosphere with many supportive videos and images. "One must 'feel' the locomotive. It is all about aware experience. Punctuality, Discipline, Patience, & being in the present are my assets that got built over years in this profession!" 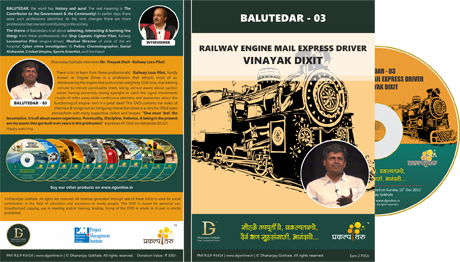 expresses Mr Dixit our Balutedar 03/12! This interaction is not only about Everest but about learning from this profession. Importance of detailed planning is understood marvelously in such projects. One cannot not afford to make mistakes here. Planning is an opportunity to make mistakes at least cost. It is not that you fight or concur the summit. One cannot fight with the power of nature. "A true professional mountaineer is the one who goes to nature with love, experiences self, who is fit & ready to face challenges. Mountaineer's conduct of life is productive, who keeps the nature clean and is polite. Mountaineer is brave at heart, with balanced mind . Mountaineer's response to the world is energetic, committed, honest, and quick." 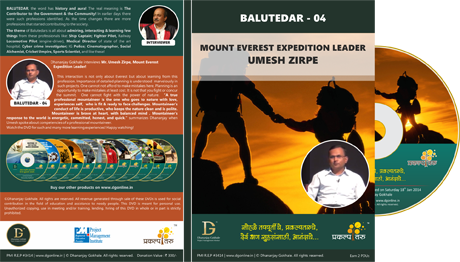 summarizes Dhananjay when Umeash spoke about competencies of a professional mountaineer. Watch the DVD for such and many more learning experiences! This interaction is not only about flights and combat, but about learning from this profession. One cannot not afford to make mistakes here. The take-off is most crucial aspects and one gets only 2 seconds to decide whether to takeoff or not. One needs to check the things fast and quick decision matters. It is all about passion. 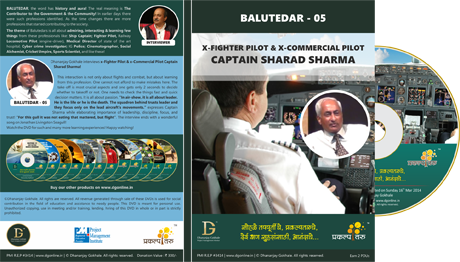 "In air-show, it is all about leader. He is the life or he is the death. The squadron behind trusts leader and they focus only on the lead aircraft's movements." expresses Captain Sharma while elaborating importance of leadership, discipline, focus, and trust! "For this gull it was not eating that mattered, but flight". The interview ends with a wonderful song on Jonathan Livingston Seagull! Watch the DVD for such and many more learning experiences! This interaction touched lots of topics – right from creating shared vision; hard-work; selecting good doctors, selecting good team members; integrity; handling corruption; using technology for efficiency; creating and using worldwide benchmarks; decentralization of work and so many more "one does not have to listen to criticism; but one has to understand it…you need to be perceptive for that…" expresses Dr Kelkar when asked about his way of handling criticism. "MAVERICK is a person who relentlessly experiments and defines the success. 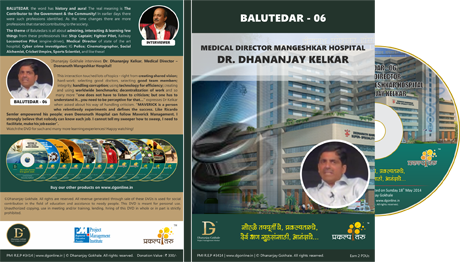 Like Ricardo Semler empowered his people; even Deenanath Hospital can follow Maverick Management. I strongly believe that nobody can know each job. I cannot tell my sweeper how to sweep, I need to facilitate, make his job easier". "Tendulkar immediately reacted on it. It burns inside. Next time when he came on the ground, he ..." Vineet shares many such interesting experiences! 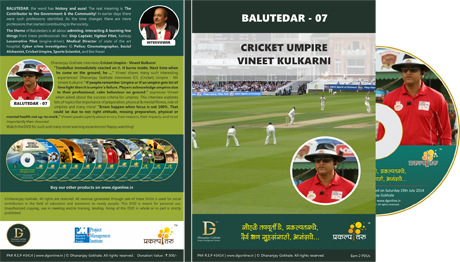 Dhananjay Gokhale interviews ICC (Cricket) Umpire - Mr Vineet Kulkarni! "If people remember Umpire or if an umpire gets lot of lime light then it is umpire's failure. Players acknowledge umpires due to their professional, calm behaviour on ground." expresses Vineet when asked about the success criteria for umpires. This interview explores lots of topics like importance of preparation, physical & mental fitness, role of umpires and many more! "Errors happen when focus is not 100%. That could be due to not right attitude, missing preparation, physical or mental health not up-to mark." Vineet speaks openly about errors, their reasons, their impacts, and most importantly their closures! "The cyber law is not weak, not slippery; it reflects where we are going as a society. It is high time that we should become aware and literate about the cyber-fraud aspects" Adv. 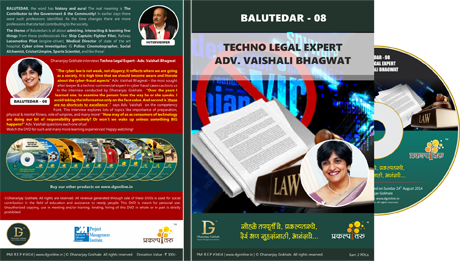 Vaishali Bhagwat – the most sought after lawyer & a techno-commercial expert in cyber fraud cases cautions us in the interview conducted by Dhananjay Gokhale. "Over the years I learned one, to examine the person from the way he or she speaks. I avoid taking the information only on the face value. And second is 'there are no shortcuts to excellence'." says Adv. Vaishali on the competency front. This interview explores lots of topics like importance of preparation, physical & mental fitness, role of umpires, and many more! "How may of us as consumers of technology are doing our bit of responsibility genuinely? Or won't we wake up unlesss something BIG happens?" Adv. Vaishali questions each one of us! 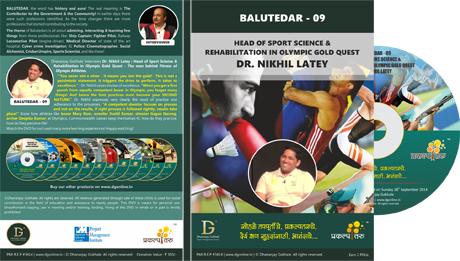 Dhananjay Gokhale interviews Dr. Nikhil Latey : Head of Sport Science & Rehabilitation in Olympic Gold Quest - The man behind Fitness of Olympic Athletes. "'You never win a silver - it means you lost the gold!'. This is not a pessimistic statement. It triggers the drive to perform. It takes to excellence." - Dr. Nikhil raises the bar of excellence. "When you get a first punch from equally competent boxer in Olympic; you forget many things! And hence the best practices must become your SECOND NATURE!" Dr. Nikhil expresses very clearly the need of practice and adherence to the processes. "A competent shooter focuses on process and not on the results, if right process is followed rightly; results take place!" Know how athletes like boxer Mary Kom, wrestler Sushil Kumar, shooter Gagan Narang, archer Deepika Kumar; at Olympics, Commonwealth Games keep themselves fit, how do they practice, how do they perceive life! Dhananjay Gokhale interviews Mr. Pramod Phalnikar : Inspector General of Police. "Only honesty will not work. It cannot take you anywhere. 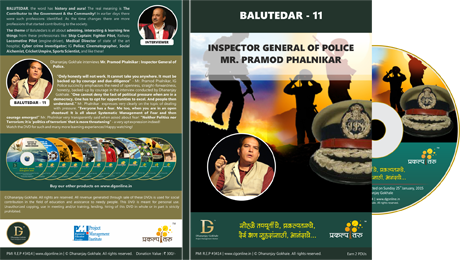 It must be backed up by courage and due-diligence" - Mr. Pramod Phalnikar, IG Police succinctly emphasises the need of openness, straight-forwardness, honesty, backed-up by courage in the interview conducted by Dhananjay Gokhale. "One cannot deny the fact of political pressure when are in a democracy. One has to opt for opportunities to excel. And people then understand." Mr. Phalnikar expresses very clearly on the topic of dealing with pressure. "Everyone has a fear. Me too, when you are in an open shootout! It is all about Systematic Management of Fear and then courage emerges!" Mr. Phalnikar very transparently said when asked about fear! "Neither Politics nor Terrorism; it is 'politics of terrorism' that is more threatening" - a very apt expression indeed! 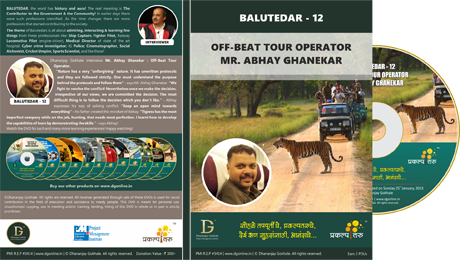 Dhananjay Gokhale interviews Mr. Abhay Ghanekar : Off-Beat Tour Operator. "Nature has a very "unforgiving" nature. It has unwritten protocols and they are followed strictly. One must understand the purpose behind the protocols and follow them" – says Mr. Abhay Ghanekar "We fight to resolve the conflict! Nevertheless once we make the decision, irrespective of our views, we are committed the decision. The most difficult thing is to follow the decision which you don't like." – Abhay expresses his way of solving conflict. "Keep an open mind towards everything" – his father created this mindset of Abhay. "Tigress has the most imperfect company while on the job, hunting, that needs most perfection. I learnt how to develop the capabilities of team by demonstrating the skills." – says Abhay!